Giving an oil massage before the bath is very good for the baby as it strengthens bones and stimulates the vagus nerve. 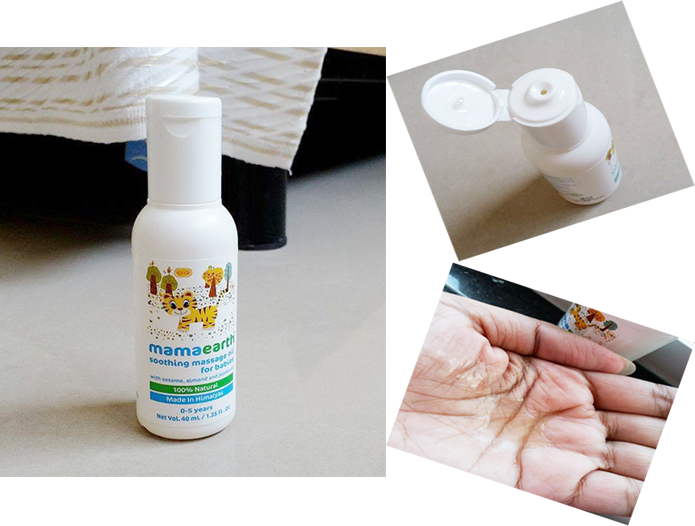 Since February I've been using this Mamaearth soothing massage oil for my boy. Today I am sharing my thoughts about this massage oil. Massage onto your baby's skin as often as needed especially after the bath. The texture of the oil is silky smooth. The consistency of the oil is runny just like other regular oils. The oil is very light-weight and this oil is transparent, no dyes use for the color. I absolutely love the scent! It has a nice herbal fragrance from essential oils and the fragrance lingers on for an hour or so after the application. Also, the oil doesn’t stain clothes. I have used this oil for my baby 2 or 3 times a week before the shower. This massage oil is not greasy and it gets absorbed into the skin very quickly without any oily or sticky feelings. It can be used as a daily moisturizer too by rubbing a little amount of oil into the skin just after finish his shower. I pour some oil on my palms and gently massage it into my baby's skin. It spreads well on the skin and immediately leaving a nice mild refreshing scent which makes the massage time even more calming and relaxing. This Soothing Massage Oil is so gentle and soothing that it’s suitable for babies from o to 5 years old. The soothing blend of natural essential oil makes it a perfect choice for night time massage which will set the tone for a calm and peaceful night for your babies. It helps keep his skin soft and hydrated and at the same time, it also pampers my hands. Overall, This stuff is awesome. Refreshing smell nothing overwhelming. It has a great feel not greasy but very moisturizing. It’s a really good quality baby Massage Oil that dermatologically approved for baby's sensitive and delicate skin that free from SLS, parabens, artificial fragrances, and colors. I love this massage oil and highly recommend.